The village of Balvicar is reached by turning west off the A816 Oban – Lochgilphead road at Kilninver (B844), heading to Kilmore then Knipoch. 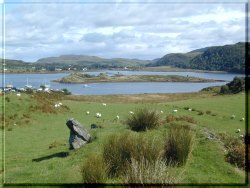 Travel to the Seil Peninsula via the famous Clachan ‘Bridge Over the Atlantic’. The post code for Seil Cottage is PA34 4RA.